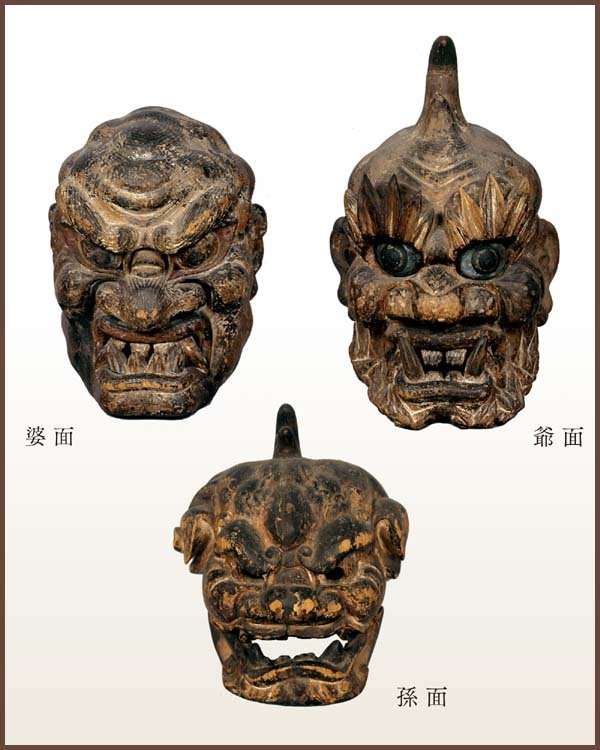 There are many festivals involving the local ONI of Japan. - - - - - . Shuten Doji Festival 酒呑童子行列 and Demon Parade .
. yatai to oni 屋台と鬼　Oni decorations on festival floats .
. Onibashiri 鬼走 running demons for Setsubun .
. Namahage なまはげ　Demons from Akita .
. Onigo Matsuri 鬼子祭り "Demon Boys Festival" .
. oniyo 鬼夜 "demon's night" fire festival . - - - - - to be updated !
. 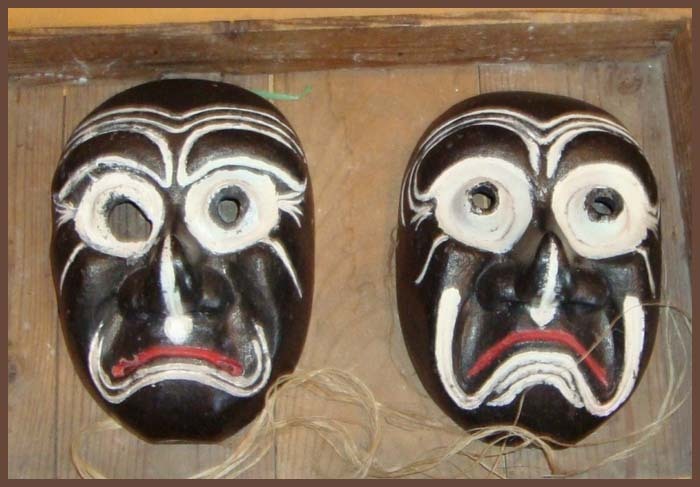 raigō, raigoo 来迎 "welcoming approach" .
. Momotaro Legend in Misaki Town 三咲町の桃太郎伝説 . In a small town in Hiroshima called 小屋浦 Koyaura, the third weekend of every October is the autumn festival. A festival the children of the town dread. ..... Terrifying demons known as マッカ（赤鬼）‘Makka’ (all red) chase the children of the town and when he catches them they get a savage hit with a stick. Sometimes the demon will also attempt to kidnap the child. The only thing that can abate the demon is if the child promises to be good from now on. Parents even willingly give their child up to be beaten and kidnapped. 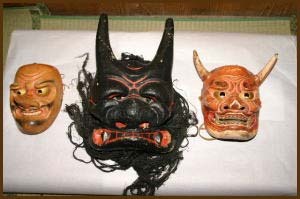 In Aichi (Mikawa 三河) there are many oni matsuri オニマツリ, all held on the 15th day of the New Year. In Nagoya the さねさこ祭 Sanesako Matsuri. 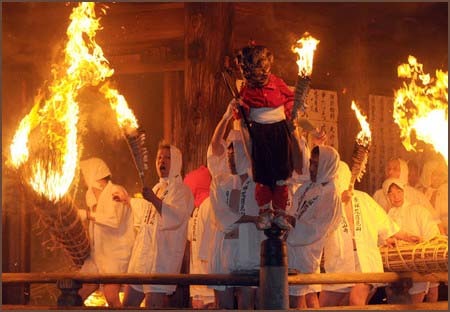 This timing is related to the Sagicho fire rituals.
. sagichoo 左義長 Sagicho Rituals . 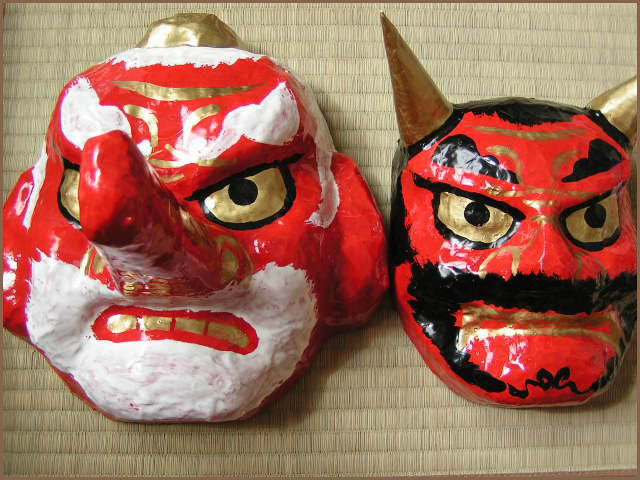 The main event of this festival is called "Aka-oni to Tengu no Karakai /rivalry between Aka-oni (Red Demon) and Tengu (long-nosed goblin)". A destructive god ( Susanoo-no-mikoto = red demon) appeared in Takamagahara (lit. "high heavenly plain", where gods live) and destroyed the granaries. People innovated dengaku performances, which soaked up this story, to a Shinto ritual festival, and to pray for a rich harvest and prosperity. 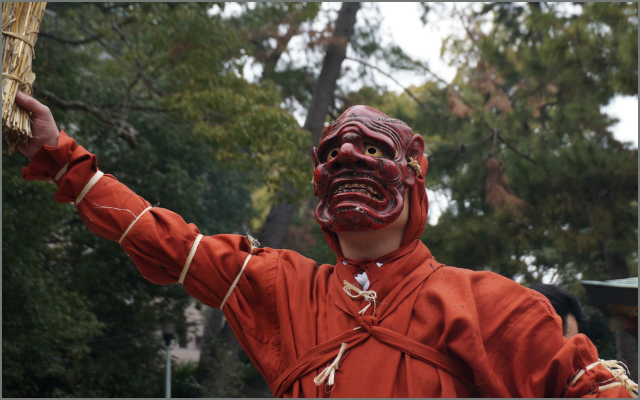 He escapes from the shrine yard and runs around the town scattering tankiri-ame (candies made from grain powders) and white grain powder over the visitors to drive out the evil.
. Tengu from Aichi .
. Uwajima Ushi-oni matsuri 宇和島牛鬼祭り Uwajima Ushi-oni festival .
. Onioi matsuri, oni-oi matsuri　鬼追い祭り . Te 修正会 Shusho-E ritual in the night of the fifth day of the New Year. 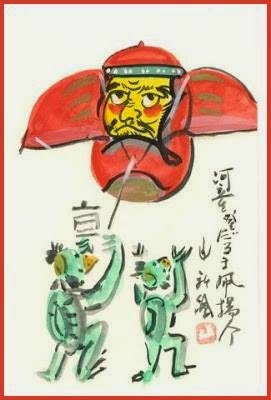 Demons who live on the sea off Takezaki and the demon masks which are kept prisoner in a box (onibako 鬼箱) in the Kannon Hall try to get out on the fifth day of the New Year and call out to each other to overthrow the island. To prevent this, the villagers have to shout even louder to protect their island - the orabigoe おらび声 heavenly voice. The villagers are only clad in a fundoshi ふんどし loincloth, so this is a famous hadaka matsuri 裸祭 naked vestival. If someone opens this Onibako, hes eyes will get sick soon or he will get a high fever. So nobody ever dared to open this box.